Over a career spanning more than thirty years many critics have praised John Foulcher’s skill at ‘capturing a moment’. The simplicity of such an observation, however, is no platitude considering how fully Foulcher achieves this. 101 Poems is a retrospective collection that shows the poet’s ability to illustrate how time can be clear and immediate. To this end Foulcher shows great versatility, expressing non-linear shifts and jumps that nod to modernist tradition while remaining singular and unique. This collection affirms that Foulcher’s artistry lies in his ability to reveal how such moments interact, and even collide, with a sharp awareness of impermanence and mortality. A dialogue between these elements runs through 101 Poems, uniting the fluctuating pitches of poetic voice as it develops across three decades: ‘This moment that doesn’t drift away, / which is shared forever in the list / of all the remembered things, some of which have happened’ (‘Why I Go to Church’). Noting the importance of Australian poets such as Robert Gray, Les Murray and Geoff Page to his artistic development, Foulcher still maintains that ‘[a]t the heart of my inspiration is my family’. 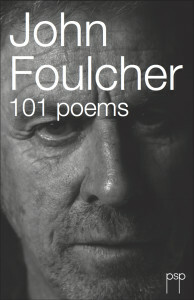 Family and interpersonal relationships constitute a significant part of Foulcher’s subject matter, which lends 101 Poems an intimacy through which the reader is invited to connect. In these poems, the speaker is an active participant, and yet also outside of the moment as an observer that records, recollects, interprets. In his most reflective moments, the poems often deal with aftermaths, especiallyin the wake of people and relationships that have passed. Equally, the speaker anticipates future circumstances. The speaker addresses his own inquiries: ‘What now?’ and ‘What if…?’ Instead of pensive detachment, there is a sense of the personal and immediate in these reflections. Foulcher engages with what he sees by imbuing it with his own personal experience. This is achieved in no small part through the uncomplicated immediacy of Foulcher’s language and uncluttered strophes, masterfully opening up the dimensions and depths. It appears almost effortless. Here we see how the immediate connects with the timeless, the idiosyncratic with the universal. while another fizzes with burns. Such mindfulness of surrounds exhibits a spiritual, even religious quality not dissimilar to that of Buddhist poetry. This is especially evident in reflections composed through nature –‘Kosciusko in Summer’, ‘Tent’, ‘At the end of the day…’ – and may well speak to the open-heartedness of the poet’s own Christian faith. The latter is a constant yet unobtrusive presence across all the collections. For Foulcher, writing poetry is both a learning experience as well as an experience of learning. All of the poems in 101 Poems, he insists, have one thing in common: ‘I’ve gained a greater understanding of myself and the world by writing them’. Poetry ‘holds up a mirror, so the lines of the face can be seen more clearly’. The key strength of this collection is the myriad points of entry it offers the reader, always intimate and ever surprising. Foulcher invites us to follow these lines, and find where they intersect with our own. This entry was posted in BOOK REVIEWS and tagged George Mouratidis, John Foulcher. Bookmark the permalink. George Mouratidis is a poet, translator and the co-director of the 2019 Greek Writers Festival. His debut collection Angel Frankenstein was published in 2018 by Soul Bay Press.